This is a very interesting concept with a very interesting taste. Strangely, it's not too bad. If you like the flavors of cabbage and Dijon mustard, then you'll like this recipe. The textures are very different as well, with a mix of dry and crumbly, crunchy, and creamy. 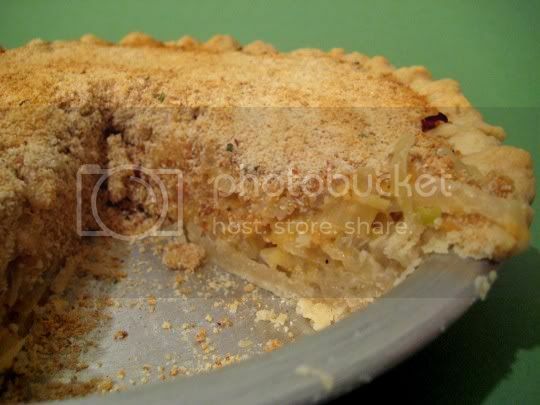 The pie is pretty simple to make: saute onions and shredded cabbage, then stir in sour cream, Dijon, and shredded cheddar. Spread the mixture into a 9" pie crust (a recipe for the savory crust is also provided, and it's probably the simplest one you'll ever make), sprinkle with bread crumbs (it will seem like a lot, but it's fine), and bake until golden brown. With each bite, you'll get a mouthful of pungent cabbage and onions, crumbly bread crumbs, and creamy tanginess. I have to say, the cheddar flavor is surprisingly nonexistent...it does provide the savory creaminess, but really the Dijon is heavily emphasized. And for only one teaspoon, it gives a huge kick. A wedge of this is quite filling, and served alongside a small salad or cup of soup, it's a nice unique meal. Make again? Possibly. It actually seemed to be better the next day.